A breathtaking promotion "UniPin Big 10" is in town now!! To all gamers who dutifully supported UniPin, we proudly present to you "UniPin Big 10", a 20 days promotion of 10% Bonus UniPin Credits. 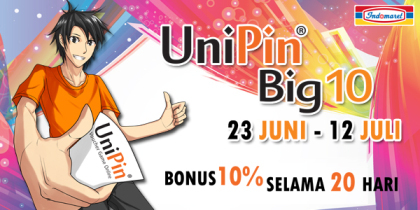 This bonus promo is eligible to all UniPin users who top up 100.000 UC and above to UniPin Wallet using UniPin vouchers, which is available at all Indomaret outlets from 23 June 2013 till 12 July 2013. So what are you waiting for, head on to the nearest Indomaret outlets and start topping up now! !